Since I have been on a pickle kick I must share these lotus root pickles. The recipe is from The Artful Vegan, a beautiful cookbook with amazing recipes. Unfortunately, most recipes take about 4 hours to prepare which I am not willing to put into dinner lately. The few things I have made from this cookbook have been amazing but laborious. 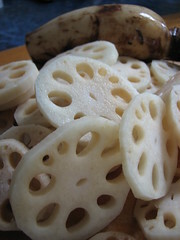 I picked up some lotus root at FuBonn down the street, which reminds me of a small Uwajimaya. I was there looking for yucca since my neighborhood grocery store doesn’t sell it. The yucca I found was covered in wax, which seems very strange to me. It must be imported from somewhere far away. The only other time I had yucca was in Ecuador where we were staying on a farm that grew it and you dug it up when you needed it. Anyways, I’m trying to talk about lotus root, which is so beautiful cross sectioned. It looks like a flower. Sliced thinly and deep fried, it’s just like potato chips with a mild flavor. I tried to bake it but it was not a success. I think it needs a LOT of oil and I wasn’t willing to dump a whole bottle of canola onto my baking sheet. But I did discover a fun new way to eat lotus root: pickled. It’s not fermented, just a straight-forward vinegar pickle which produces a nice, crispy pretty pickle to serve at parties or force on visitors. I love pickles but I have a hard time incorporating it into my diet since it’s more of an appetizer or snack, neither of which is common in my house. But I’ve found that with balancing two jobs some nights it’s burger night and it’s great to have some pickles on your plate to eat along with your meal. If anyone has any interesting uses for pickles, please let me know. I’m always trying to incorporate pickles and kraut more in my diet. So all in all, it’s beautiful but expensive as fries or pickles. I’d rather just use potatoes (fries) or cucumbers (pickles) but it was a fun experiment. Very pretty! I’ve never had lotus root. I’ve only ever had lotus root steamed in a veggie stir-fry. But I didn’t feel it really added much to the experience. However, lotus root is beautiful. I love your blog and I read your about page- I think we have very similar ideas and ideals about food.